Punta Gorda and Port Charlotte are blessed with Charlotte Harbor, which offers some of the best sailing anywhere. With 120 square miles of cruising waters in the harbor, and access to the Gulf of Mexico, as well as inland passages north and south, the harbor has an endless series of adventures waiting in store for you. Charlotte Harbor is fed by the Myakka River and Peace River, both of which are navigable for quite some distance in our shoal-draft sailboats. The upper harbor offers protected sailing on those windy days; to the south, the harbor opens up to a large expanse of water that offers long stretches for a relaxing reach across the harbor on a nice day. Daysailers and cruising sailboats alike may want to head to Cabbage Key for an outdoor lunch and refreshing tropical drink, or to Cayo Costa for an afternoon of shelling or picnicing on the beautiful white beaches. Protected anchorages abound up and down the Intracoastal Waterway from Pine Island all the way up past the harbor; shoal-draft sailboats, in particular, have a wide variety of anchorage options available. Charbor Harbor can be reached from the south via the cross-state waterway, which leads from the Atlantic side across Lake Okeechobee and down the Caloosahatchee River to the Fort Myers and Cape Coral area. At the mouth of the Caloosahatchee is the southern entrance to Charlotte Harbor from the Gulf of Mexico. The ICW leads up through Pine Island Sound, passing Sanibel Island, home of the Ding Darling Wildlife Refuge. Pine Island, on the east side of the sound, remains largely agricultural and unpopulated. The sound is dotted with many mangrove islands, affording great fishing and opportunities for wildlife viewing. 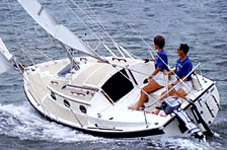 Although a fixed bridge at Matlacha Pass prevents most sailboat access to Charlotte Harbor, shoal-draft sailboats drawing two to three feet may wish to explore Little Pine Island Sound, an inside passage to the east of Pine Island, before sailing north in Pine Island Sound to the harbor. Once into the main harbor, Boca Grande Pass to the west provides a deep-water passage to the Gulf of Mexico. The pass itself is world-famous for its tarpon fishing. Gasparilla Island and Gasparilla Sound, on the north side of the pass, have marina facilities for fueling and provisioning, restaurants, haul-out service, and yet more anchorages and islands to explore before leaving Charlotte Harbor and heading north to Venice.